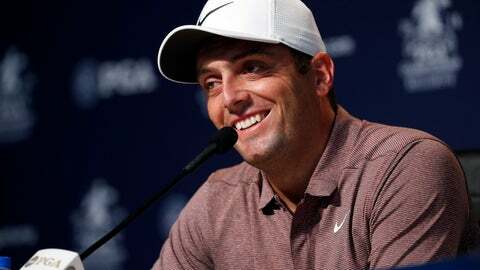 ST. LOUIS (AP) — Francesco Molinari made his major championship debut 12 years ago at the Masters alongside Tiger Woods and didn’t make it to the weekend. He still hasn’t taken a sip from the silver claret jug. Molinari had a holiday with his family, headed to Ohio for a World Golf Championship and then flew straight to Bellerive for the PGA Championship, the final major of the year. Even with a middling performance at Firestone last week — he only broke par on the last day with a 69 — Molinari’s confidence is soaring. He is regarded as the hottest player in golf this summer, starting with his victory in the BMW PGA Championship at Wentworth, adding an eight-shot victory at the Quicken Loans National and capping it off with his first major championship. He hasn’t experienced the fame that comes with winning a major because it was just over two weeks ago and it’s been business as usual. But odds are no one would notice him at Bellerive had his name not been engraved on the claret jug.